NewsSpotter+ Ka-Sat SNG broadcast satellite transmission. Cologne, Paris September 2014: Eutelsat Communications and leading broadcast network operator, MEDIA BROADCAST, have announced at IBC in Amsterdam that they have inked an agreement for the distribution of the satellite-based IP broadcast solution, NewsSpotter. MEDIA BROADCAST is optimising the NewsSpotter service by linking it with its Broadcast NGN (Next Generation Network) to offer the media industry new options for IP-based data transmissions and digital TV production. It will market the service under the name NewsSpotter+. 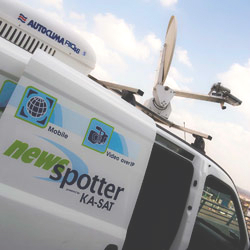 The NewsSpotter service operates in Ka-band using Eutelsat’s High Throughput KA-SAT satellite for cost-efficient, portable, IP-based Satellite News Gathering (SNG) services. The innovative service uses compact, lightweight and easy-to-carry terminals to enable fast and high quality transmissions from the field. MEDIA BROADCAST will market the service under the name NewsSpotter+ and combine the IP broadcast solution with its own operated Broadcast NGN (Next Generation Network) without using the public Internet to offer an end-to-end QoS without any shared resource. By combining its fibre network capabilities with access to a flexible, portable satellite-based contribution solution, MEDIA BROADCAST will be able to offer new options to the media industry for IP-based data transmissions and digital TV production. MEDIA BROADCAST will market NewsSpotter+ with two-way dedicated bandwidth that is scalable between 512 kbps and 10 Mbps (Up- and Download, End-to-End). Signal contribution is made via the MEDIA BROADCAST NGN with fixed assigned bandwidth and at the customary high availability. This comes with high-performing Internet access from MEDIA BROADCAST’s own ISP. End customers will be provided with an optimised online management, reporting and booking portal that can be easily used via PC, smartphone or tablet. The price model for the service is flexible and transparent. It is based on volume of best effort and booked sessions for transmissions. High quality service with 24/7 technical support completes the service package. On the hardware side, MEDIA BROADCAST supports the complete range of KA-SAT antennas, from fully automised SNG-solutions to portable flyaway bag solutions. EUTELSAT’s KA-SAT is the first High Throughput Satellite (HTS) in Europe, offering throughput of more than 90 Gbps. Eutelsat and partners offer a range of innovative services through the infrastructure for broadcasters, business customers and consumers in Europe, North Africa and the Middle East under different brands including the Tooway™ consumer broadband service as well as NewsSpotter for professional applications.